The body set up to look after the UK's rail infrastructure has fallen into the red, but will pay all its staff bonuses anyway. 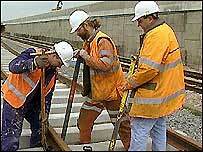 Network Rail made an operating loss of £758m in the year to 31 March, against an operating profit of £80m last time. All staff will receive a bonus on their salary, which is worth around £100,000 at chief executive level. The company says there was a 7% reduction in delays, but admits one in five trains still do not run on time. Train performance improved by only 7% during the year, against a target of 10%, but Network Rail chairman Ian McAllister said it improved by 20% for the second half of the year. 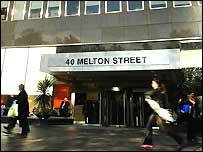 Speaking to BBC Radio 4's Today programme, he said: "We are still losing money, that was expected, but we are in a transitional period." He said revenue would be increasing over the next five years. And he said the financial bonuses were deserved because several targets have been reached. Executive directors of the company are to receive bonuses of 24% of their basic salary despite failing to meet the performance target on train punctuality. Chief executive John Armitt will get £112,320, while deputy chief executive Iain Coucher will get £99,840. Other staff at Network Rail, the not-for-profit body set up by the government in 2002 to replace Railtrack, will get a bonus of about £600. The executive directors could have received a total potential award of 32% of their basic salary for meeting two of the three targets, which also include condition of infrastructure and cost efficiency. Mr McAllister said the objective of the "transparent" bonus system was "to align" the interests of executives with those of passengers and tax payers. "We have made improvements in cost efficiency and infrastructure, and reached those targets. We need a balanced score-card. "It would be possible to reach levels of punctuality while abandoning efficiency, or not looking after the assets properly. You can achieve punctuality levels at the long term-cost of asset condition." Network Rail said £544m of the loss was attributable to a change in phasing of network grant income from the Strategic Rail Authority (SRA). It said its debts of £12.6bn were £1.3bn lower than forecast in October 2002. Transport Secretary Alistair Darling said: "Network Rail is making progress in resolving the problems inherited from the disaster that was Railtrack."